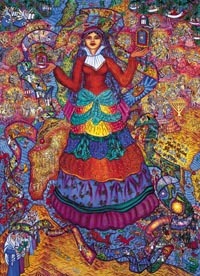 Front of card is a scaled reproduction of "Dona Gracia Mendes", the 1998 oil painting by Barbara Mendes. and to those seeking Heroic women in history. holy traditions, which are also shown and glorified in the painting.